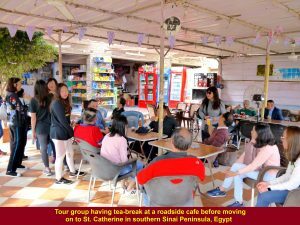 Early in the morning, we left Cairo and would be on a long journey on the road by coach to St. Catherine and then to Sharm el Sheikh in Sinai Peninsula, Egypt. 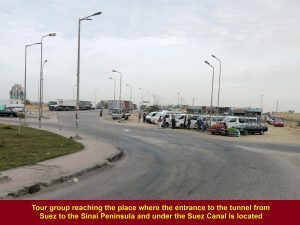 To go to Sinai Peninsula from Cairo our coach had to go through a tunnel under the Suez Canal. 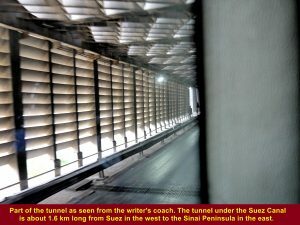 Known as Ahmed Hamdi Tunnel it is about 1.63 km long and about 120 km east of Cairo. 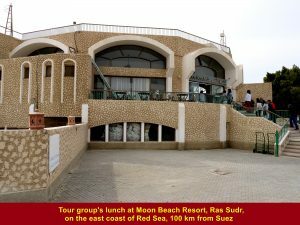 It was opened in 1981 and reopened in 1992. 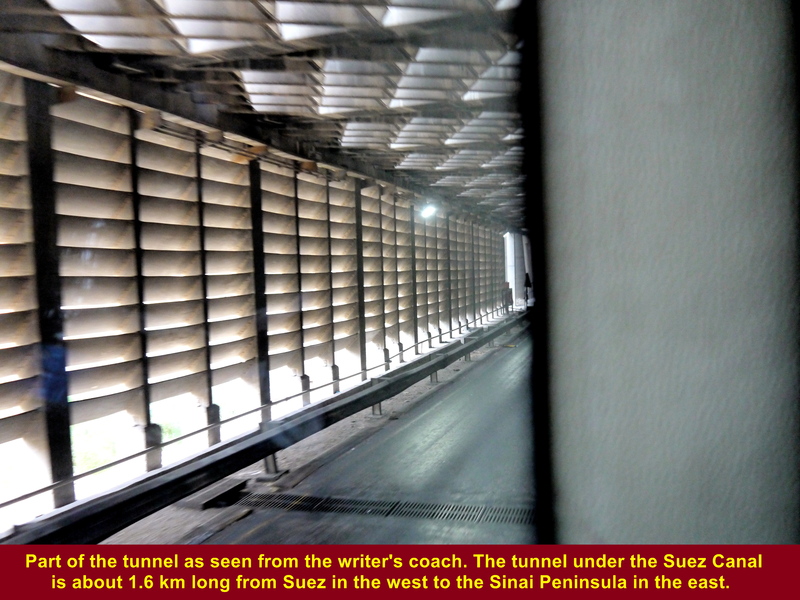 Part of the Ahmed Hamdi Tunnel as seen from the writer’s moving coach. 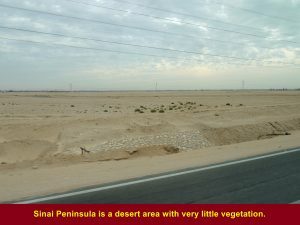 Sinai Peninsula is a desert area with very little vegetation and rain. 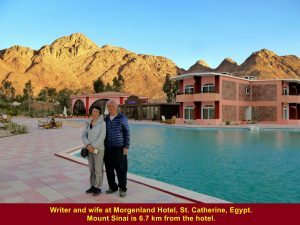 The roads were straight and looked new. 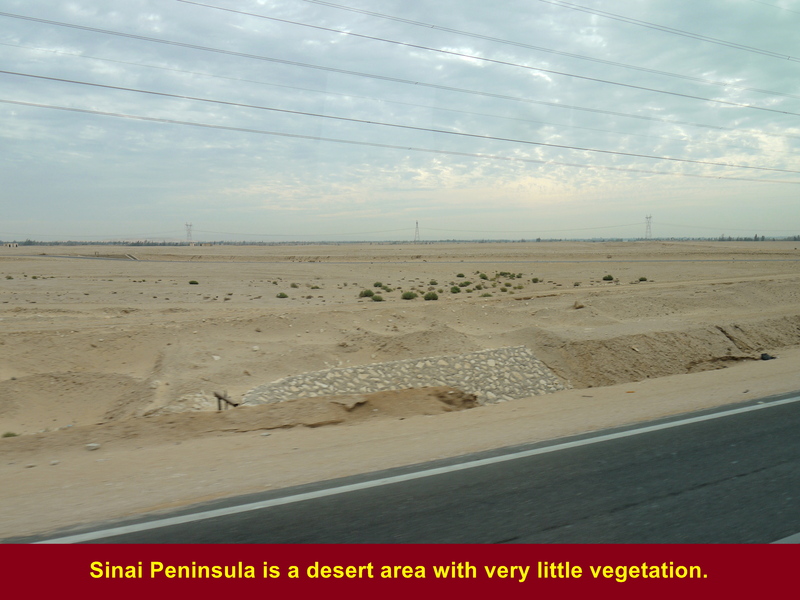 Sinai Peninsula is a desert area with very little vegetation and rain. 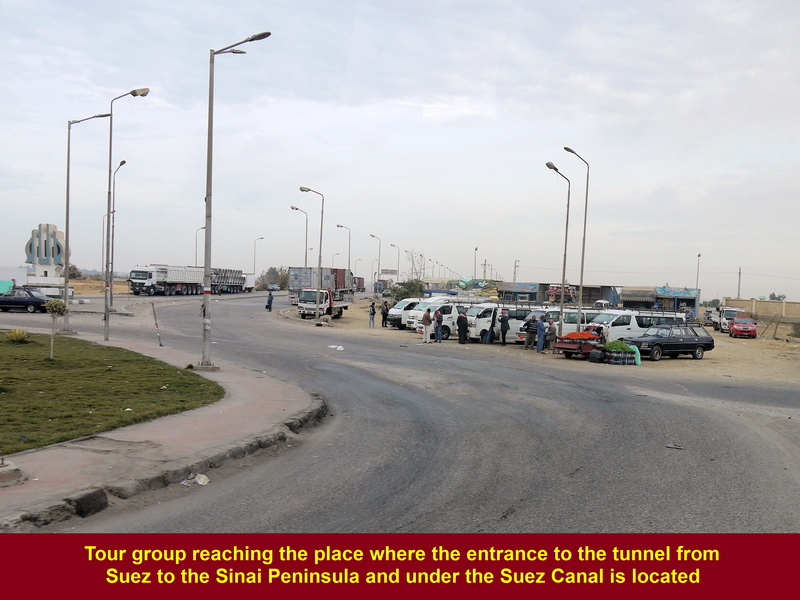 On the way to St. Catherine we stopped at a place, Elim, which is 100 km south-east of the tunnel in Suez. There was a well in its oasis. 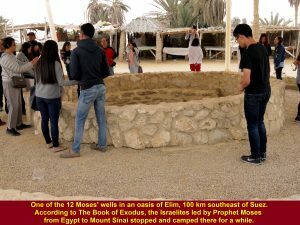 It was one of the 12 wells used by Prophet Moses and his followers, Israelites, who were on their way to the promised land. 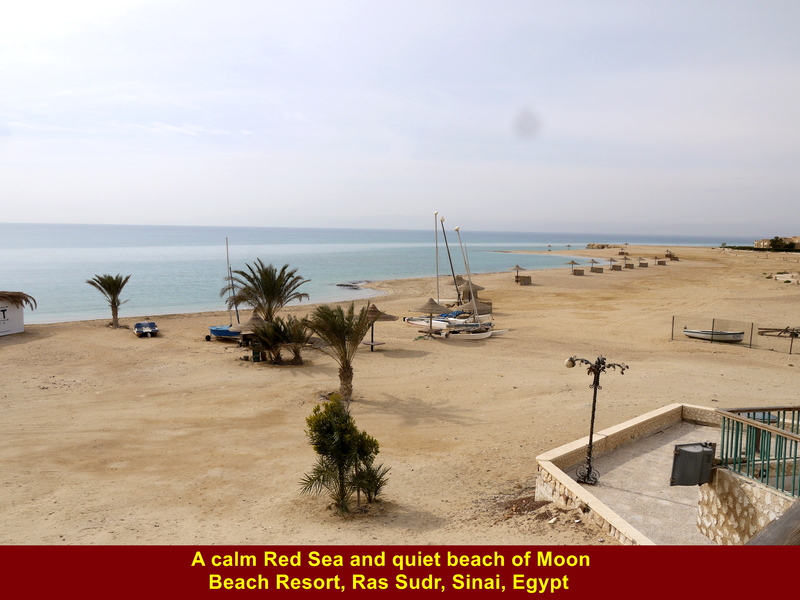 According to the Book of Exodus, Moses led Israelites to escape from the ancient Egyptian army. 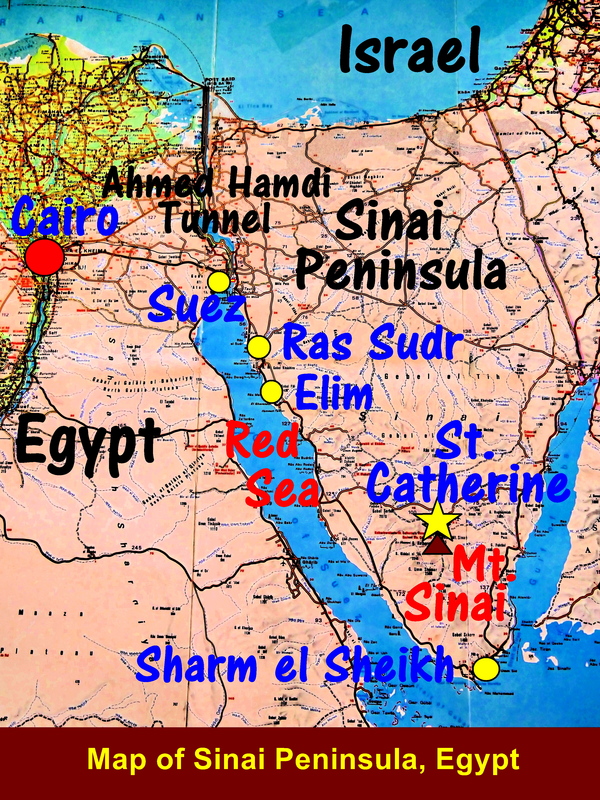 They then crossed the Red Sea parted by God to a promised land in Sinai Peninsula. 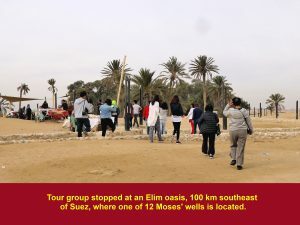 On the way to the promised land, they stopped at several wells. One of them was at in the Elim oasis. 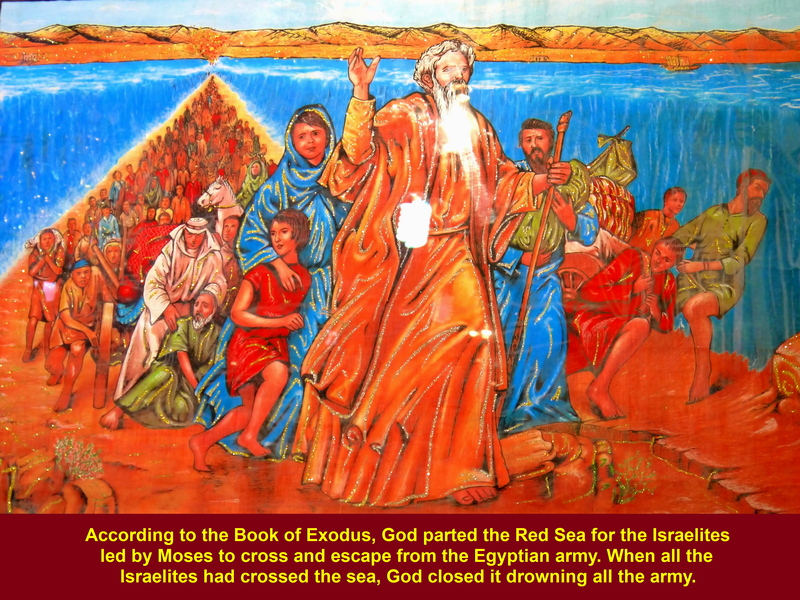 A painting showing Moses leading Israelites across the Red Sea parted by God to a promised land in Sinai Peninsula. 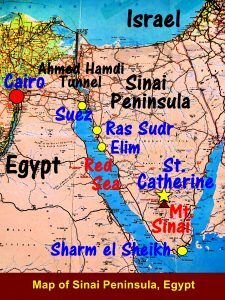 They were being pursued by their enemies, the ancient Egyptian army. Moses leading Israelites and crossing the Red Sea parted by God to escape from the ancient Egyptian army, according to the Book of Exodus. 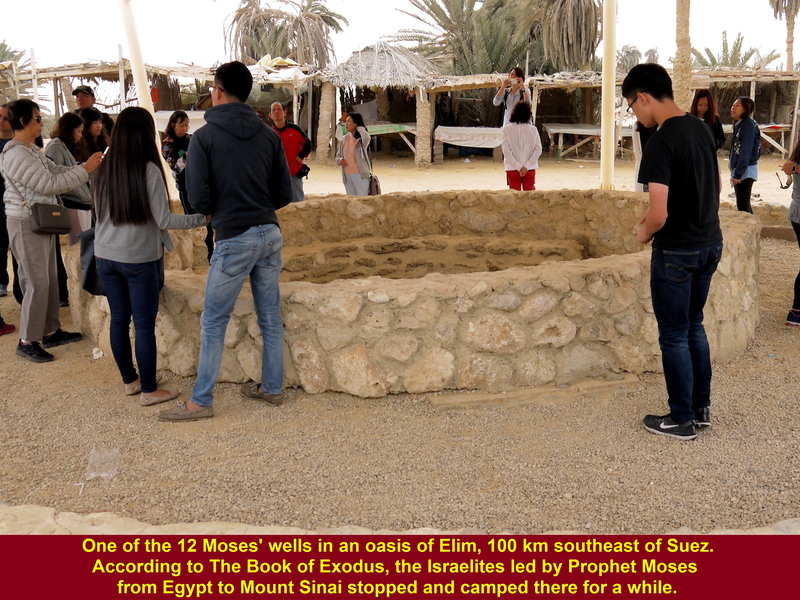 Tour group stopped at Elim which is 100 km south-east of Suez to see one of the 12 Moses’ wells in the oasis. 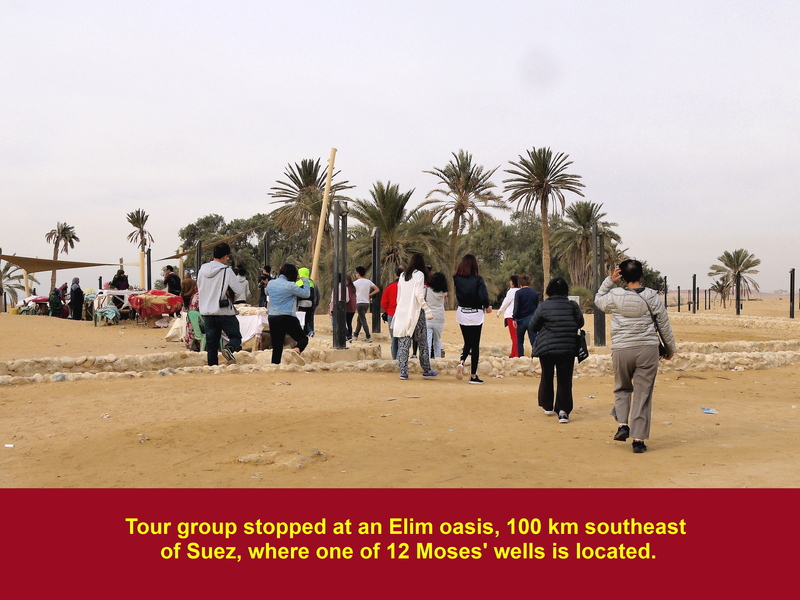 The Israelites led by Moses stopped and camped at the well for a short while before they continued their journey to the promised land, according to the Book of Exodus. 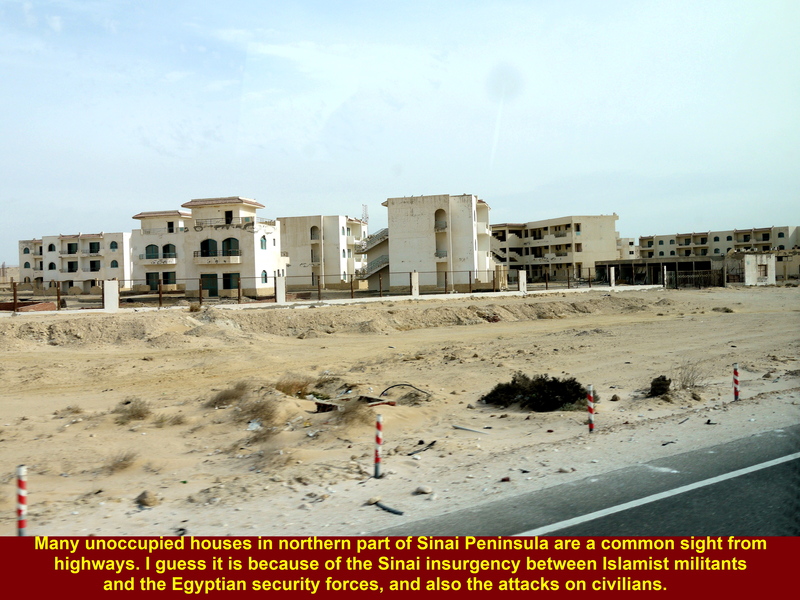 On the journey in northern Sinai Peninsula, we noticed many houses were unoccupied by civilians. 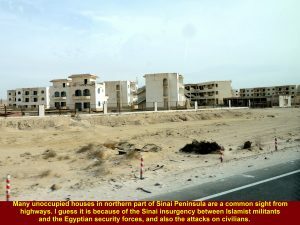 It was due to Sinai insurgency between the Islamist militants and the Egyptian security forces. Besides, the civilians were afraid of being attacked by the militants. 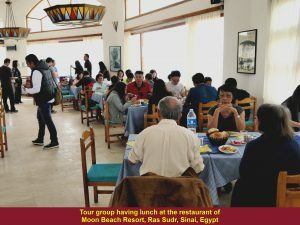 Tour group stopped at Moon Beach Resort Restaurant, Ras Sudr, for lunch after travelling 226 km by road from Cairo. After lunch we left Ras Sudr and travelled another 200 km to St. Catherine. 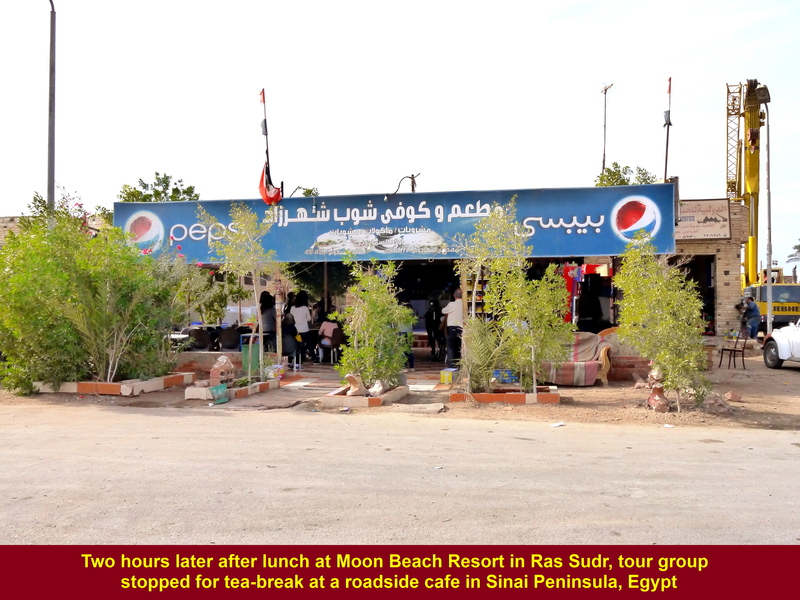 But two hours later, we stopped at a roadside cafe for tea-break. 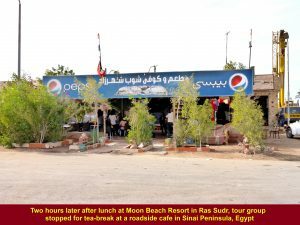 Tea-break at a roadside cafe. 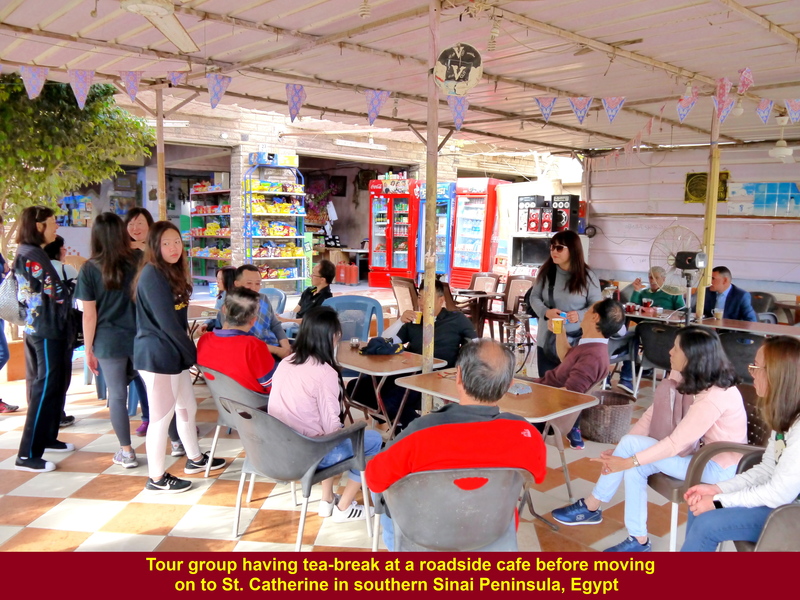 Tour group relaxing at a roadside cafe for a short while before they continued their journey to St. Catherine in the south. 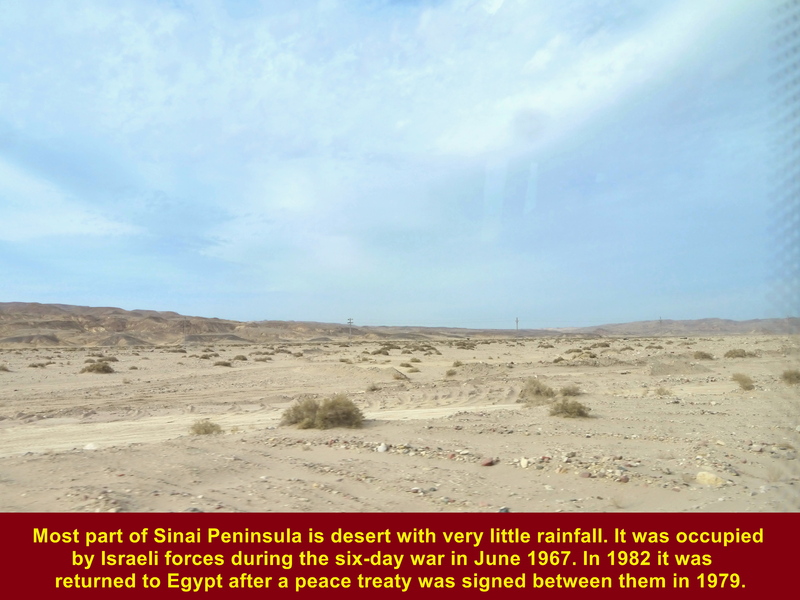 Sinai Peninsula was occupied by the Israeli forces from 1967 until 1982. 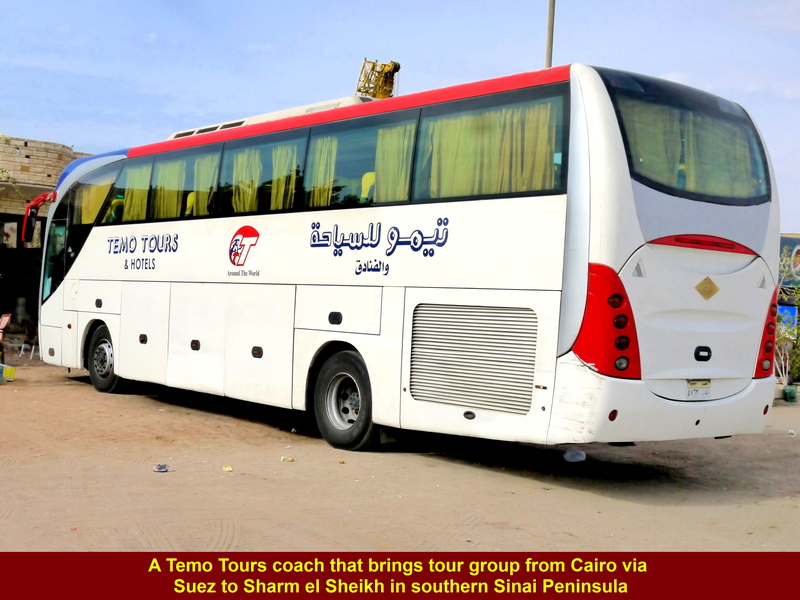 It was returned to Egypt in 1982 although the Peace Treaty between them was signed in 1979. 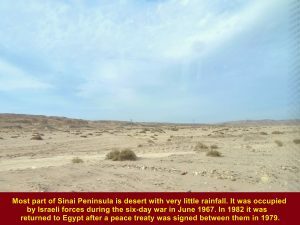 Sinai Peninsula was occupied by Israeli forces from 1967 until 1982. 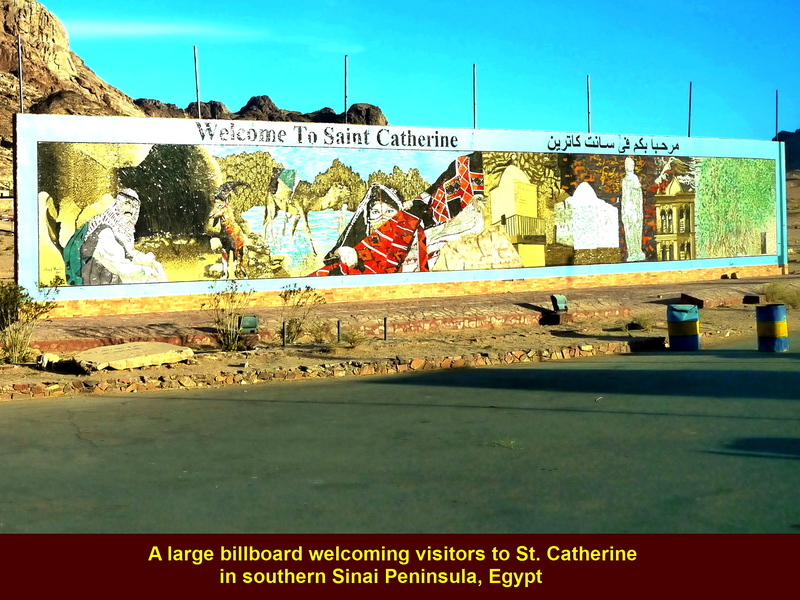 After a long journey from Cairo via the Suez tunnel, we finally reached St. Catherine in Sinai Peninsula. 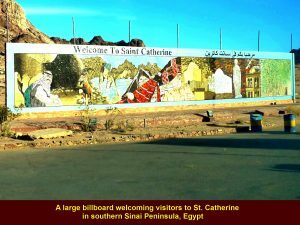 We had travelled a total distance of abou 440 km on the road from Cairo to St. Catherine during the whole day. 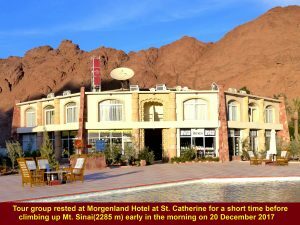 We would stay at a hotel, Morgenland Hotel, for a night. But some of us would leave the place after midnight and travelled 6.7 km to the foot of a mountain, Mount Sinai, which is 2285 metres above sea-level and then climbed up the mountain to its peak in pitch-darkness. 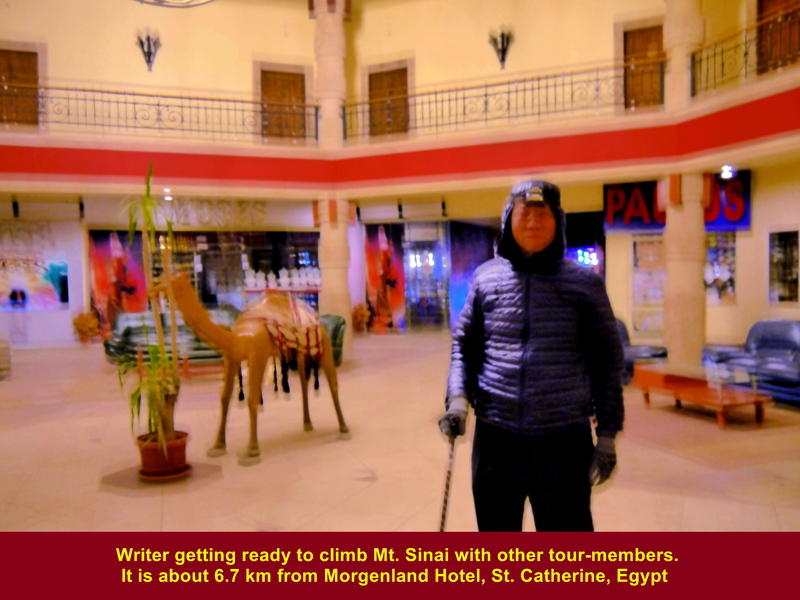 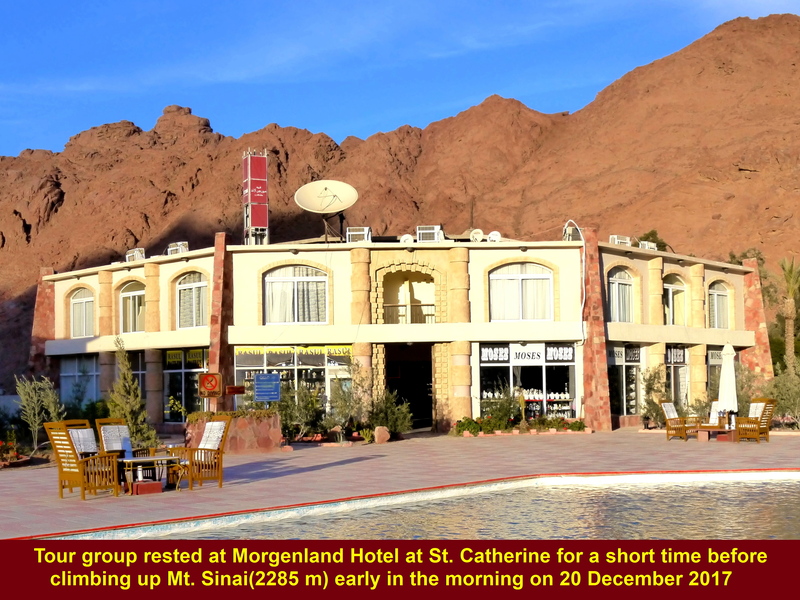 Tour group resting at Morgenland Hotel at St. Catherine before climbing Mount Sinai(2285 metres) after midnight. 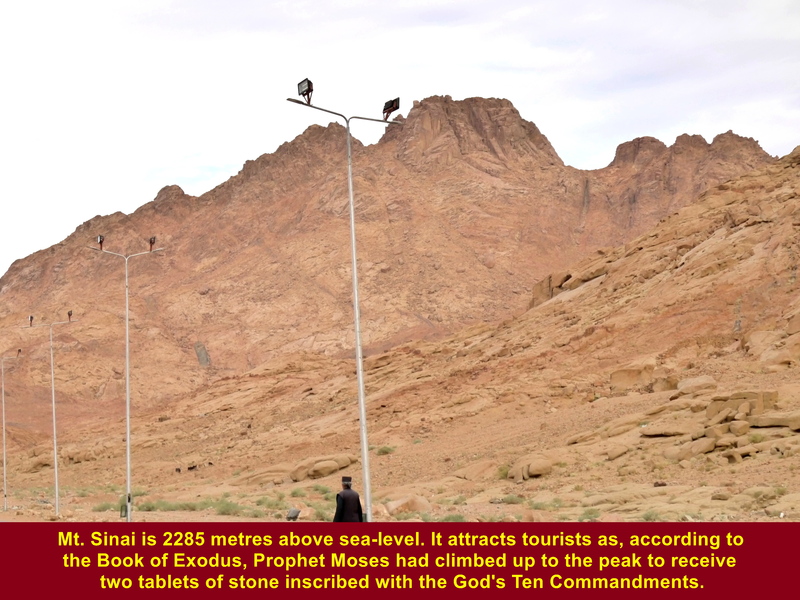 According to the Book of Exodus, Moses went up Mt. 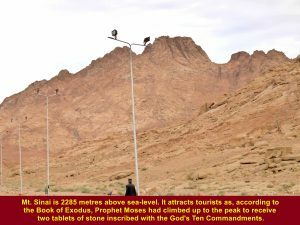 Sinai to receive two tablets of stone inscribed with the God’s Ten Commandments.